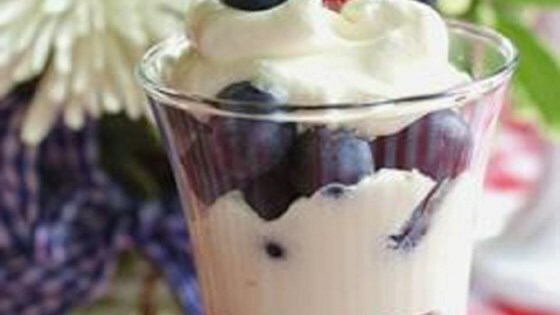 "This is a quick and easy way to top off any meal with the light taste of sweet berries. You can use fresh seasonal berries or the frozen ones work just as well. Top with a few berries and mint leaves for garnish." In a blender, combine blueberries, strawberries and whipped topping. Blend until smooth. Transfer to a mixing bowl and fold in raspberries and blackberries. Layer the berry mixture with the frozen yogurt in 6 dessert glasses, finishing with a berry layer. Serve at once. I made this for a dinner party and everyone loved them! I used real whipped cream and frozen strawberries and it was delicious. Very easy to prepare too. simple and delicious. I get many requests for this recipe. I make my own whipped cream and use frozen fruit in the off season. Highly recommend. Yum! I only had huckleberries and blackberries, and after mixing it with the whipped cream I decided to mix ice cream in the blender with the berry mixture. The best shake I've ever made!